Today (September 29) has proved to be a major day for forests as 183 countries at the CITES 17th Conference of the Parties (CoP17) agreed to boost protection for dalbergia rosewoods. The Committee session introduced three separate Dalbergia proposals, all met with overwhelming support by the Parties which demonstrated a greater awareness of the threats posed by illegal logging and trade on the conservation status of this species in response to surging demand from China’s Hongmu furniture market. 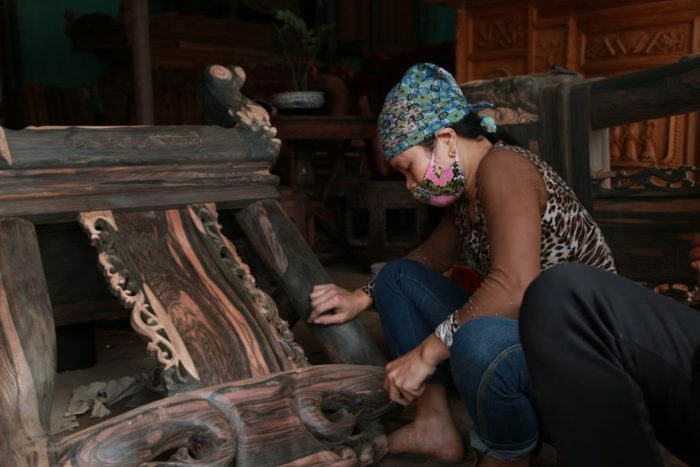 Today, Thailand successfully presented its case to amend the trade annotation on the CITES listing for Siamese rosewood (Dalbergia cochinchinensis), endemic to Thailand, Cambodia, Laos and Vietnam. 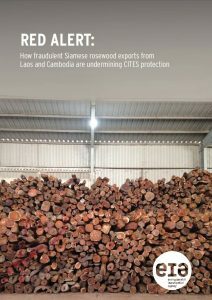 EIA has followed the legal/illegal trade in Siamese rosewood since the last CoP in 2013, and contributed an overview of our investigations. We concluded that trade has been far from restricted, that all parts and derivatives including roots continued to be traded in circumvention of the annotation and that illegal products passed through customs and other border agencies as semi-finished wood products. For the past three years, EIA has maintained that an amendment to the annotation is not only justified to close the loophole but critical to prevent the commercial extinction of this species. We are extremely pleased to see adoption of the amendment. In recent years, global populations of Dalbergia have experienced a boom in trade, especially illegal trade, spurring range states Argentina, Brazil, Guatemala and Kenya to lead a proposal to place all Dalbergia timber species onto CITES Appendix II. This was a bold step in conservation, especially given that more than 300 species of timbers and shrubs are found within the Dalbergia genus, but after significant discussion on the floor and broad support the proposal passed. The co-proponents worked together to draw up a new annotation, covering commercial trade with a few exceptions, including personal items, such as musical instruments, up to 10kg; Dalbergia cochinchinensis in Thailand, which has a stricter annotation; and Dalbergia populations originating in Mexico that were listed in the third Dalbergia proposal of the day. The United Nations Office on Drugs and Crime spoke out on illegal trade and provided data from the its World Wildlife Crime Report. Between 2005 and 2014, reportedly 35 per cent of all wildlife seizures were of rosewood – equal to the combined value of all seizures of elephant ivory, rhino horn, pangolins, big cats, corals and marine turtles. Parties to CITES today displayed an understanding of the precautionary principle required to prevent traders from continuing to deplete Dalbergias and other sought-after species, putting the brakes on trade before it’s too late.